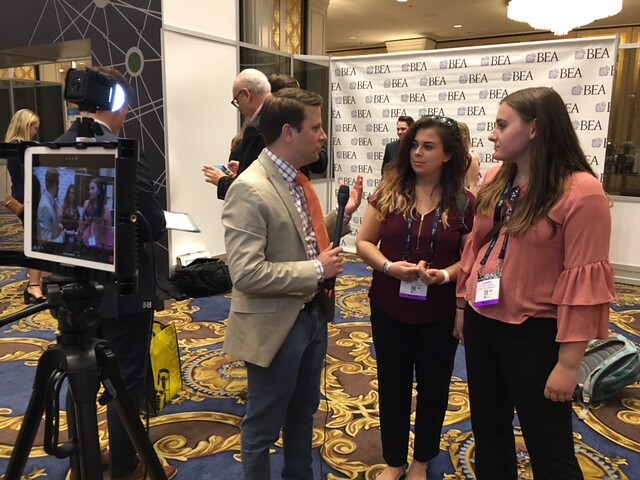 Point Point Park University School of Communication students attended the annual Broadcast Education Association conference and National Association of Broadcasters show in Las Vegas April 7-10. The students attended panel discussions and workshops with educators from across the country at the BEA conference. The NAB show displayed the newest technology from some of the world’s largest companies. 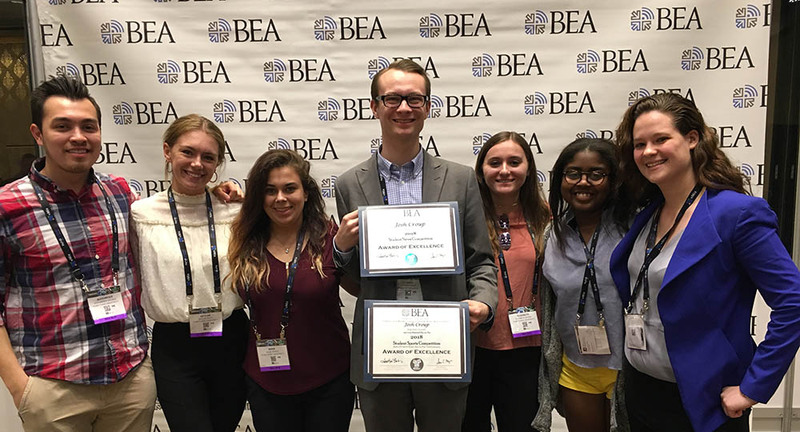 Senior broadcast reporting student Josh Croup was honored with two awards in the annual BEA Festival of the Arts competition. Croup received Awards of Excellence in the student news and sports competitions, placing him in the top five ranks in the national competition. Croup placed in the news anchor category of the student news competition for his work on U-View Television. He was recognized in the play-by-play category of the student sports competition for his basketball broadcasts on the Point Park Sports Network. The students were accompanied by School of Communication faculty who moderated and spoke on educational panels at the national conference, including Thom Baggerman, Robin Cecala, Tim Hudson, Rosemary Martinelli and Heather Starr Fiedler. “I networked with news directors, producers and on-air talent from all over the world. The conversations I had with these professionals will always stick with me as I pursue a career in broadcasting. I'd absolutely recommend students to go as it gets you out of your comfort zone and truly shows you what the real world is like.” — Jess Paterchak, broadcast production and media management major from Blackhawk High School in Chippewa, Pa.
“This conference gave me drive and even more passion for broadcasting. I hope U-View will send in more material for the conference next year because we have great content and resources to win several of the awards at BEA.” — Prim Green, broadcast production and media management major from Northsprings High School in Atlanta, Ga.
“The biggest takeaway from the conference was realizing how small the broadcast world truly is. I ran into a man I met in Washington, D.C. during my internship in summer of 2016. It was great catching up.” — Alex Grubbs, broadcast reporting major from East Allegheny High School in Wilmerding, Pa.
“We are very fortunate for the opportunities we are given, especially to travel. We have the BEA conference, the International Media class, as well as annual trips to New York and Washington D.C. It is awesome that we have those opportunities and the people who take the time to make these trips possible.” — Lizzie Spisak, broadcast production and media management major from South Allegheny High School in Glassport, Pa.